Many people have different definitions for credit but the actual meaning is the ability to borrow money for a promise of a future payment. Meaning if you borrow money from anyone, that can be from friends to the government, you have to pay them back in the future. The two forms of credit that can be used or taken out are personal loans and credit cards. Credit cards are your own plastic cards that transfer your bank account money to places you have to pay so you don't have to carry around a big chunk of money. Personal loans can be used on buying a new house, new car and even school. These are received from the bank and you have to be approved for one, by looking at your credit report. To receive you credit report, the list of payments you had to pay and whether they were payed on time or not, you contact the Credit Bureau they contain the information from every adult and if payments were made to any loans or credit cards, bills, personal expenses etc, where credit was used. This determines your credit score, which is a list of numbers 300-850 the higher the better your score is. Now that we have a background about how you receive credit let's go back to how you would determine whether or not you will receive the credit. It is figured out the the 3 C's of creditworthiness, reliability to pay back a loan, which are character, capacity and capital. Remember the lender, person/ organization borrowing you the credit/money, can withhold the loan if he/she thinks you are unfit to later pay it off and can also attach a interest to your loan. Interest or APR which is money paid regularly at a particular rate for the use of money lent, or for delaying the payment of debt. In other words and annual percentage rate that will be given with the amount of credit you borrowed. 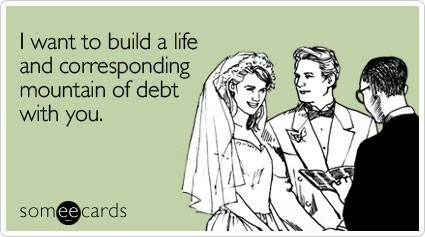 Just some debit humor, couples usually run into debt after marriage since they obtain a lot of costly things together. 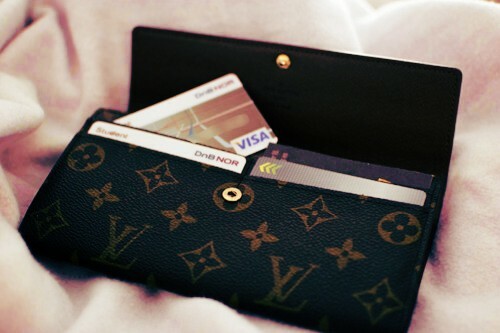 Two types of credit cards: Visa-card and MasterCard. You can also own store credit cards which are similar to normal credit cards except you can't use them anywhere else besides that specific store. Do you have the ability to pay the money that you borrowed back? Can you make your payments on time? Why? These are all questions associated with credit worthiness, which is basically the ability to pay the loan/ money borrowed back. This is determined, as I mentioned before, by the 3 C's. The three C's are Character, Capacity and Capital. Character is a sense of financial responsibility, dependency and looks into your career and determines if its steady. It also looks into where and if you own a residence. It looks into credit history and whether your bills were paid on time. Capacity is the financial ability to pay back the loan. It also looks into if you have a high enough income to determine the loan and the major expenses and debt you ran into. Lastly is Capital, and that is the value of what you own. The savings investments, and property. You can use capital to pay loan if you need to. These will be the people you will receive your credit report from. They have a copy of every adult there is out there. They carry all the information about your credit history. Anything from what you bought, to who you bought it from. Did you pay rent on time? Did you miss a payment? Was your check or the check you handed in bounced? Have you been sued or filled for bankruptcy? The credit bureau answers all these questions on a basic sheet of paper and records them. After that they can assign you your credit score; a number that reflects your credit worthiness. You can retrieve them by asking for them from Trans Union, Equifax or Experian. This is your credit information and credit score. It is provided by the Credit Bureau and requested by you, the lenders. when is it given to you? When you apply for credit, or even when you simply request it. However you will only receive it once a year for free and then the other times could have a small fee attached to them. You can also request it if you suspect you became a victim of identity theft, which is you think that someone has stolen your I.D and all your personal information and is using it for his/ her advantage without your knowledge or permission. A credit card is basically a plastic card which is linked with your checking account in the bank and you can use it to transfer your money when paying so you don't have to carry around all the money that you have on your checking account in the bank. You can use them anywhere where they accept credit cards, restaurants, shopping malls etc. There are regular charge accounts which are payed in full balance like american express, but there are other that carry a balance from month to month which is VISA or MasterCard. With this shiny piece of plastic you want to start young about 18 so you can build your credit score. You also have a limit on your spending which is a credit limit, this is the money restriction/limit that you cant go over, its a specific amount you can spend, and is different for every credit card.IF you do go over the limit there will be a over-the-limit fee. However there come many costs with credit cards like the many penalty fees and lets not forget about interest. Interest is an annual percentage rate that you pay on your credit card it could be from 0%-29% if you pay your entire balance the the due date you obviously receive no interest. The annual fee is the required annual money you must pay for that credit card which varies from $15-$100. The penalty fee is an additional fee due to late payment like going over your credit limit, bounced check etc. This can also raise your interest rate. Smart Consumer: Don't Fall Into the Credit Card Trap! If you decide you do want to start using a credit card here are some tips to guide you through the way so you don't make mistakes like other people have done in the past years. Don't give out your person information to random people. Know what you're buying. Don't go out and spend thousands of dollars on clothes when you don't really need them. Buy something you actually need like a home, pay for your school, and even a new car. These are things that are needed and worth paying off in the long run. With clothes and things not needed, you can rank in many thousands of dollars of debt. Do not go over the credit limit! If you want something and its 3,000 but your credit card only lets you go up to 1,500 do not buy it. This can really damage your credit score and heighten your APR. So basically if you don't need it, don't buy it, that should be consumers every rule about credit cards. And if you don't have enough, don't buy it. Two simple rules that consumers won't forget. ScoreSense provides information on keeping your credit, identity, neighborhood information at your fingertips.At ScoreSense速 we believe everyone should have access to the information that helps keeps their finances and families secure. Visit www.scoresense.com for more information.